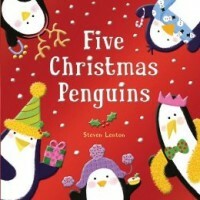 Get ready for some counting fun with five spunky penguins as they prepare for the best Christmas party ever! Whether zooming through the snow, decorating the tree, wrapping presents or singing, artist Steven Lenton’s adorable, playful penguins will get kids in the holiday spirit and help them improve their counting skills! Perfect for holiday gifts, Five Christmas Penguins features a foil and embossed cover treatment with shiny foil throughout.